The hot 2011 fashion trend for both clothing and hair accessories are all about feathers this fall. Trisha’s Salon has a fully stocked inventory of single and bundled feathers for your hair. Styles and colors vary from naturals to funky pinks and blues. 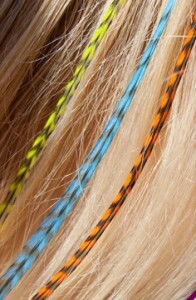 We attach them to your hair in the salon in a matter of minutes after selecting your colors. You can return to have them quickly removed and re-attached at any time for re-use.